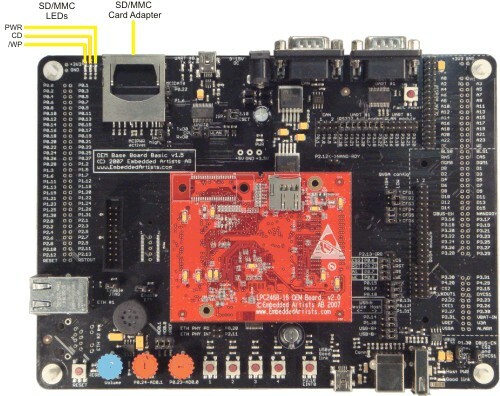 The MCB2400 board supports one SD/MMC memory card connector that allows you to connect a wide range of SD/MMC memory cards. The /WP LED indicates WRITE-PROTECT signal is active(low). The CD LED indicates that CARD-DETECT signal is active(low) and that an SD/MMC card is detected. The PWR LED indicates that 3.3 VDC power is present to the SD/MMC card connector.